“St. 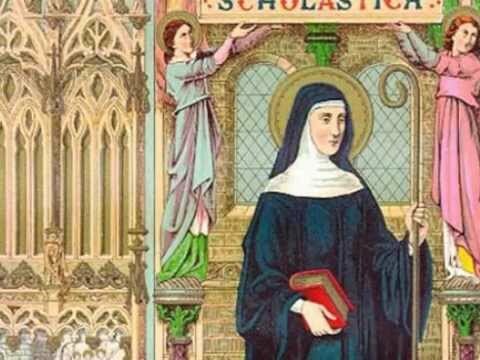 Gregory tells us that St. Benedict governed nuns as well as monks, and it seems clear that St. Scholastica must have been their abbess, under his direction. She used to visit her brother once a year and, since she was not allowed to enter his monastery, he used to go with some of his monks to meet her at a house a little way off. They spent these visits praising God and in conversing together on spiritual matters. “St. Gregory gives a remarkable description of the last of these visits. After they had passed the day as usual they sat down in the evening to have supper. When it was finished, Scholastica, possibly foreseeing that it would be their last interview in this world, begged her brother to delay his return till the next day that they might spend the time discoursing of the joys of Heaven. Benedict, who was unwilling to transgress his rule, told her that he could not pass a night away from his monastery. When Scholastica found that she could not move him, she laid her head upon her hands which were clasped together on the table and besought God to interpose on her behalf. “Benedict was therefore forced to comply with her request, and they spent the night talking about holy things and about the felicity of the blessed to which they both ardently aspired and which she was soon to enjoy.